In all occasion photography activity is taking place, whether it’s for weddings, parties, graduation ceremony among others, photos taken are expected to capture just the good moments only. To ensure that only these photos are taken and non-others, a legal document known as photography contract is used. The document ensures that both the photography and their client agree on same terms and no one’s rights are violated. On this post, we have reviewed some of the Service Contract Samples. 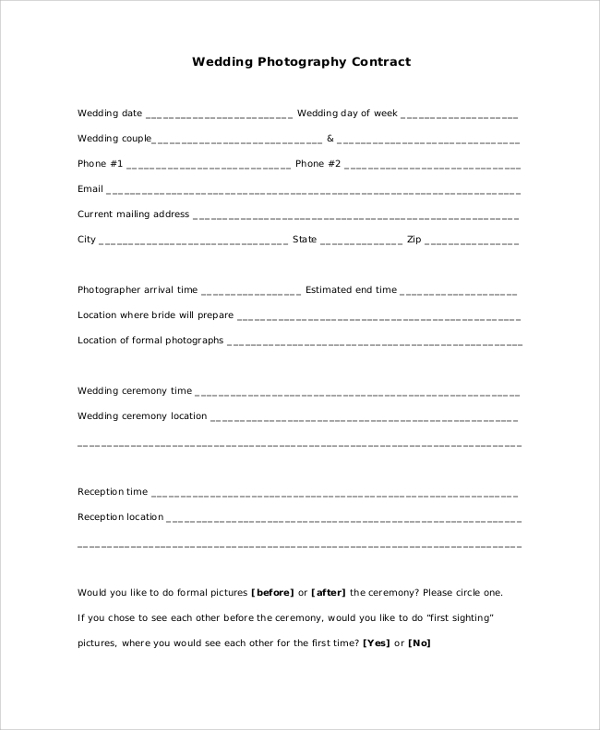 A wedding photography contract sample is a customizable document prepared for people holding weddings and the photographers so as to avoid negative issues that may arise during the photo shoot or an after the photo shoot and ensure both parties rights are not violated. Portrait photography is a taking photo of a person or a group of people in different places or in a photo studio. Most of these photos are for personal use only. To ensure that the photos are not used against your wishes you require a portrait photography contract between you and the photographer. Photographers can use the sample as a guide or as a template. A commercial photography contract sample is a document that can be used as a guide while preparing a contract for commercial photography. The document ensures that all the required information of such a contract is included and the contract is written following the standard format. The sample is also customizable and comes in various document formats. Most events require photographs taken so as to record moments. A photographer is so much required for the events photos to be taken professionally. 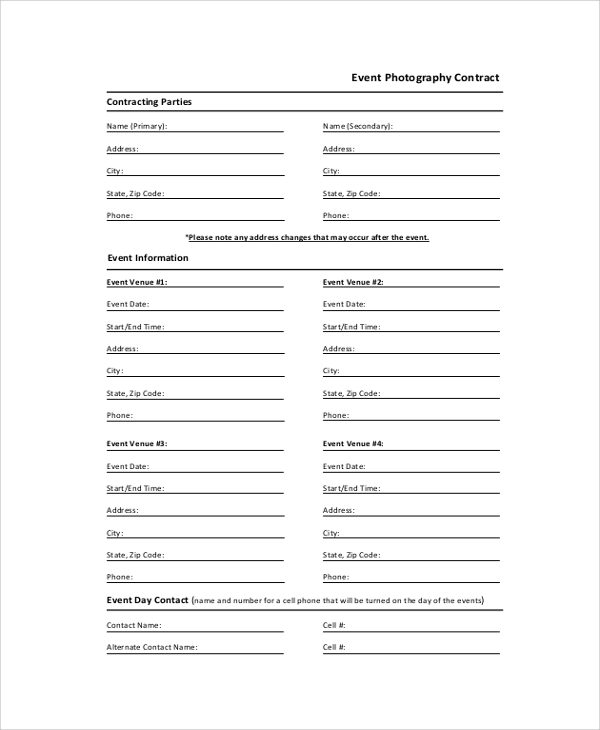 For the event holder and the event photography to agree on same terms, an agreement is required which is a contract between the two to ensure everybody is treated fairly. 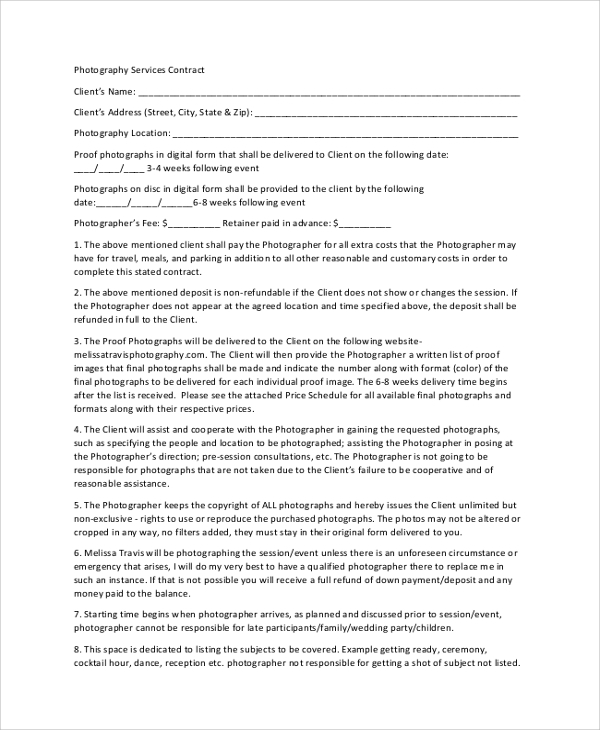 A photography contract sample is needed by either the photographer or the client whenever the clients want to have photos taken. The contract ensures that the agreed terms and conditions between the two parties are followed and finally the client expectations are met and the photographer is paid to do his/work. 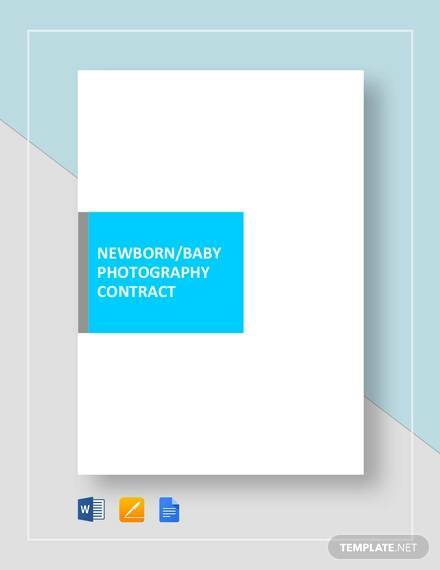 The photography contract helps the photographer get paid in agreed time and failure to do so the client can be taken to court and be fined for failing to pay the amount agreed on. The photography contract is a legal document and it should be followed by both parties strictly. 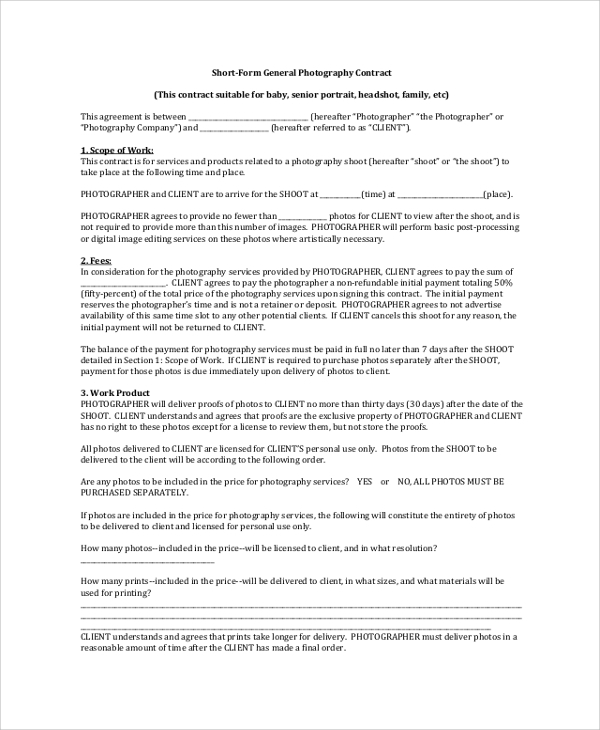 How to Write a Photography Contract? 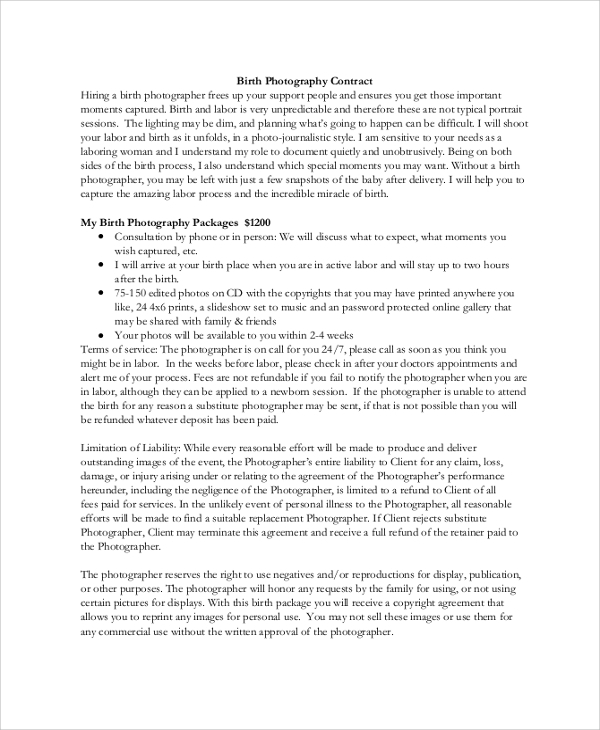 Writing a photography contract document requires both parties to be together and discuss their terms as they are penned down. It’s recommended that the contract should be written by a person who understands the law but anyone can write as long as they have a clue of what to include in the contract. 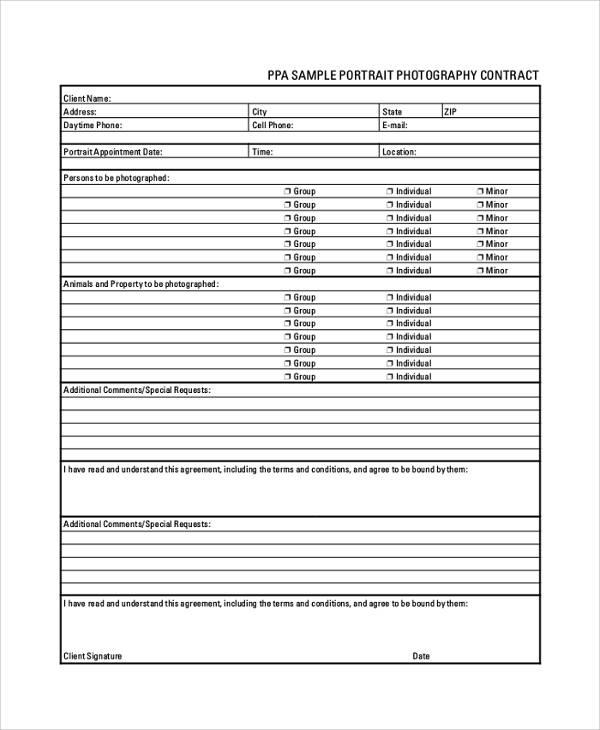 Downloading a template or a sample of a photography contract from the internet can be recommended since it will ensure that contract is complete without any information left out. After the contract has been prepared both parties are also required to sign so for the document to be valid. 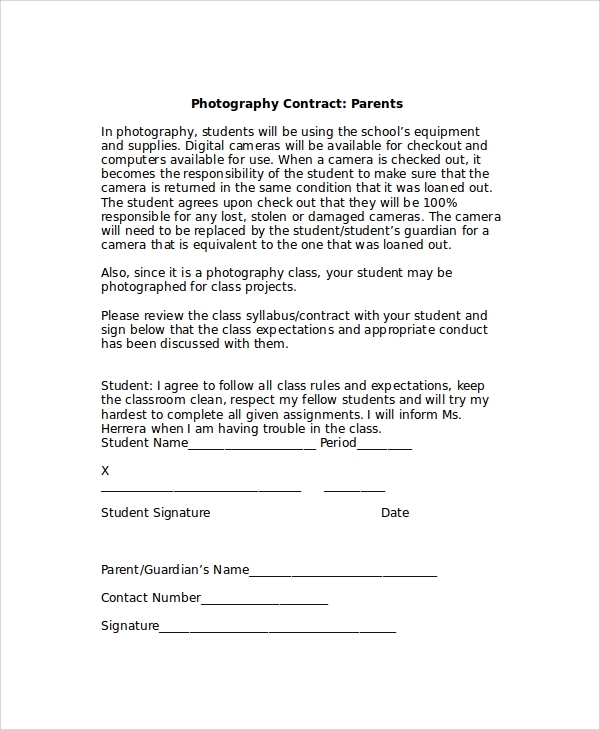 While writing a photography contract there are tips you can follow to ensure that your documents meet all requirements. 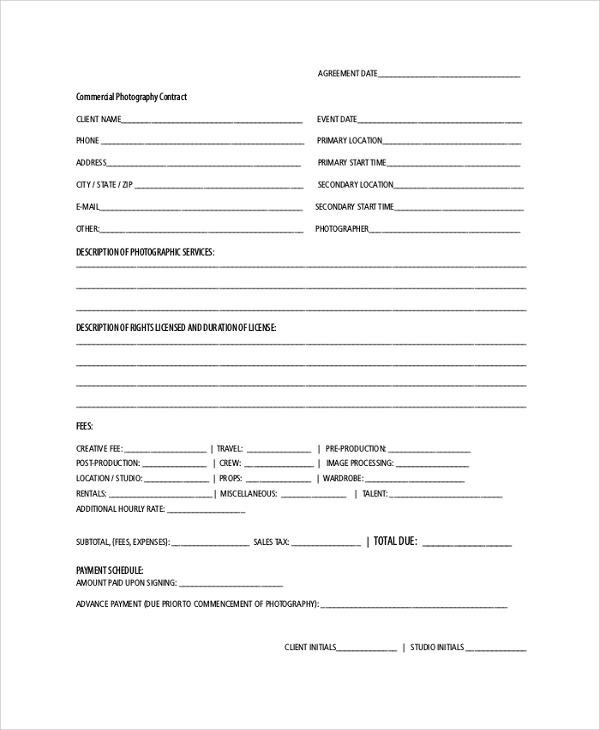 These tips include; use a simple language and short and clear sentences, don’t forget to include the date and the venue of the event, ensure that both parties are present while penning down the contract, the amount to be paid to the photographer shouldn’t be left out of the document and for the contract both parties must sign. Photography contract helps people to eradicate inconveniences that may arise after the act of taking photographs is done. It ensures that none of the parties i.e., the photographer and the client get unfair treatments and this ensures there is no quarrel between the two.You can also see Loan Contract Samples.